Making the process an enjoyable experience! Keeping it as simple as possible and making sure your needs are taken care of are the number one priorities. Keeping your budget in mind! You have a budget – and we want to stay within it. Bringing the experience of multiple disciplines into the project helps us think creatively and pull the project together effectively. It will end up saving you money! Giving you a product that speaks to you! No matter what the project, it should be something that speaks to you – for you specifically. We have the ability to help you pull the pieces together! 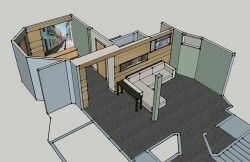 3D rendering has helped our clients visualize the final product. It is an efficient tool to use before construction even begins! This service is available to you if you decide to use it! Residential Exterior and ‘Residential Kitchen $60,001-$75,000’! Moss Envy, St. Louis Park (http://www.mossenvy.com) …for all things green! The Tangiers, Minneapolis (http://www.thetangiersmpls.com) …for a great locally owned place to eat, drink and lounge! Audio Logic Systems (http://audiologicsystems.com) …for all things sound!